When a member comes to your unit interested in membership, what do you hand them? Is it a comprehensive packet describing the membership process, or a URL scribbled on a napkin? Do they have a clear understanding of the expectations of membership, the process to become a member, and the road ahead, or is it more important to get their name scribbled on the dotted line? Join us on Monday, May 21st at 8pm Eastern Time for a presentation about how to improve the materials you put in prospective members' hands. If you are unfamiliar with YouTube Live, it is essentially a live broadcast of a You Tube video session using screen sharing, video and audio. You do not need a Google account to participate or view this presentation. Questions can be submitted via the Live Chat function in YouTube Live, or via Twitter using the hashtag #CAPRecruiting. Please share this email with your fellow members and commanders via email and other social media. Thanks very much for your time and what you do for Civil Air Patrol. As someone who has been in advertising and marketing for over 45 years, it does surprise me that a national org like CAP has so few marketing materials "ready to go" for Squadrons to use. At this point local Squadrons should have a large variety of options from National "in the can" and always at the ready. Local folks shouldn't have to develop things on their own at the local level. Which can often wind up being 'cheesy'. It would be great if Hdqs could at some point set aside enough funds to get a large Ad Agency involved to develop a full campaign worthy of CAP. OK. That off my chest, and since it may be a few years before we see that dream ... yes, I do look forward to the seeing the webinar to see what others are doing. It would be great if Hdqs could at some point set aside enough funds to get a large Ad Agency involved to develop a full campaign worthy of CAP. The last time we did that, we ended up with goofy email signature that broke everyone's email and caused a huge SUI mess. LOL ... Well I was thinking more along the lines of some Wall Street quality video spots that could run on local TV as well as social media, along with high class brochures and handouts. A lots of folks in CAP have produced some really nice work, but its not consistent across the board and not up to the level of production values to really showcase our organization. No one watches TV anymore. If we were to run a national advertising campaign, it'd be through YouTube, Instagram, Snapchat, etc. Gotta meet the youth where they are, not where us old farts think they were 20 years ago. You do realize that the USAF's advertising budget request for FY 2019 is $93,447,000, right? Something like 37x the entire National non-appropriated fund budget for CAP. National needs to be doing awareness level information. "This is Civil Air Patrol" type stuff. When you spend 20-25 secs of your 30 sec initial contact explaining what CAP is, you've lost the battle. You don't get time to get to the local level of information where you'd be able to make the deal. If folks come up and are saying "Hey, I've heard of this Civil Air Patrol thing and I know you're into it, can you tell me more about it? ", you're already half way done with the recruiting. "13. Describe the universe. Give three examples." Even 'high-level' awareness is difficult, but there's no doubt we need more. Lots more. 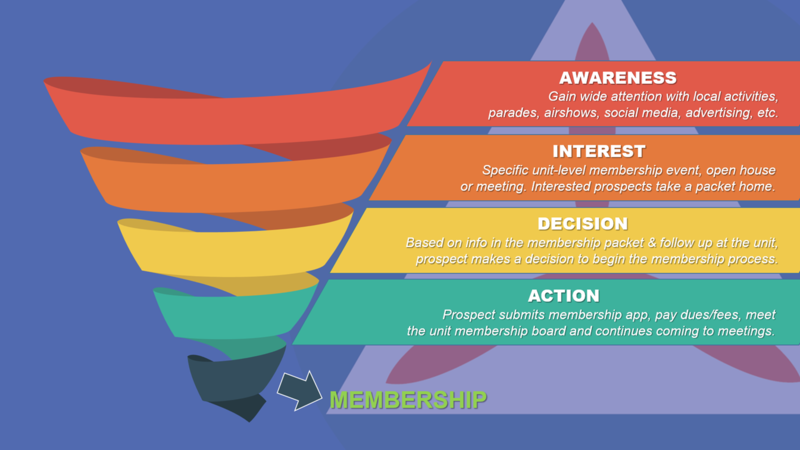 I recently was at a meeting concerning some program changes and brought up the "sales funnel" concept of "AIDA". Most of what we can be doing Nationally is the Awareness (or "Attention" depending on your preferred acronym) part. After that, it drives down to the local level in the ability of units the convert a prospect's Interest into a Decision and Action. If you're putting your best foot forward, the D & A part is easier. I suspect we're losing a lot more people further down in the process than we care to admit, however. Sure. That much not needed. We could have a series of videos and brochures produced at a national quality for less than what a new C-172 cost. It would be money well spent. OK, I submit to you that yes, pretty good stuff could be created for that much (or even probably less). But realize: you're talking about an amount of money that is nearly 15% of the current non-appropriated funds budget. Thats a pretty hefty ask. Where, pray tell, does that money come from? Out of the money presently allocated from the non-appropriated funds, what might you suggest we NOT spend money on to then spend money on this? Does National budget anything for recruiting? What do you spend it on? NHQ, along with a lot of other people these days, thinks TwitSpace is marketing. It's not. media campaign, that is supported with Wing and local recruiting initiatives, along with a lot of cleaning house. to fly under the radar, while bumps and warts can go largely unnoticed. This is a decades-old problem that takes a decade to fix, and no one has even nailed up the white board yet. I missed the webinar while it was live, but just watched it now. Great job Nin. You covered lots of ground with good info. I downloaded the sample kit and will say I'm impressed. I haven't seen any other Squadron take it to this level. I'll be stealing a few ideas. There is a budget for "exhibits" which the recruiting materials that are sent to units comes out of. This is used for things like the EAA booth, AFA, other displays, etc. Thats the whole idea, Ed. Steal away. I have laid bare most of what we do at my unit in terms of recruiting (open houses, cohort recruiting, our packets, our presentations, etc) over the years for others to crib from and I'm happy to do so without credit or anything. My "credit" for the use of those materials comes in the success of the organizations that use them. and especially the last couple quarters - we had a LOT of really new cadets at encampment this year.